We are one of the eminent Manufacturers, Exporters and Suppliers of Rubber Hoses. Offered in varied specifications by us, these Rubber Hoses are suitable for varied industrial applications. Buyers can purchase Rubber Hoses from us at competitive prices and place bulk orders. We can provide customized Rubber Hoses within the stipulated budget. 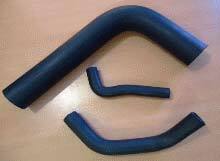 Clients seeking for Rubber Hoses of varied grades can come to us.